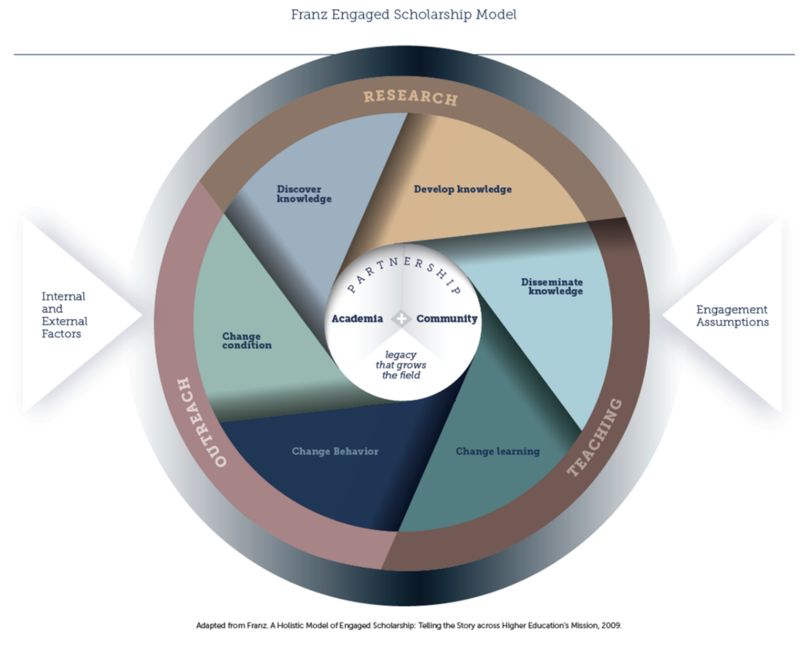 In Franz’s Engaged Scholarship Model, all layers of community engagement are equal in importance. 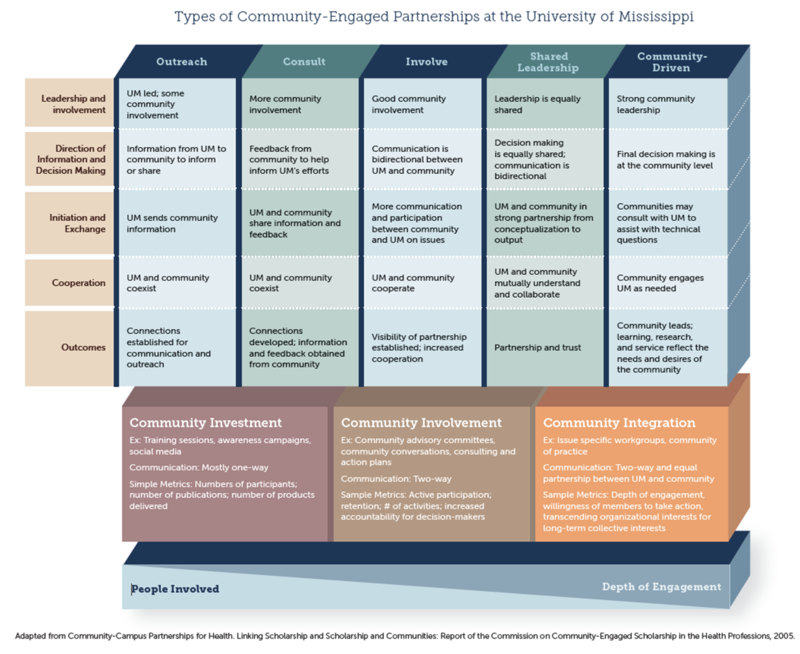 The two-way collaboration between UM scholars and community partners are central in the model, emphasizing its significance as the identifying feature of engaged scholarship. The purpose of the two-way partnership is to produce a legacy that grows the discipline while benefiting communities. Engaged scholars use some or all of the six entry points in the next layer to produce and communicate creative work that grows the discipline and benefits communities through the discovery, development, or dissemination knowledge that may change learning, behavior, and conditions within communities. 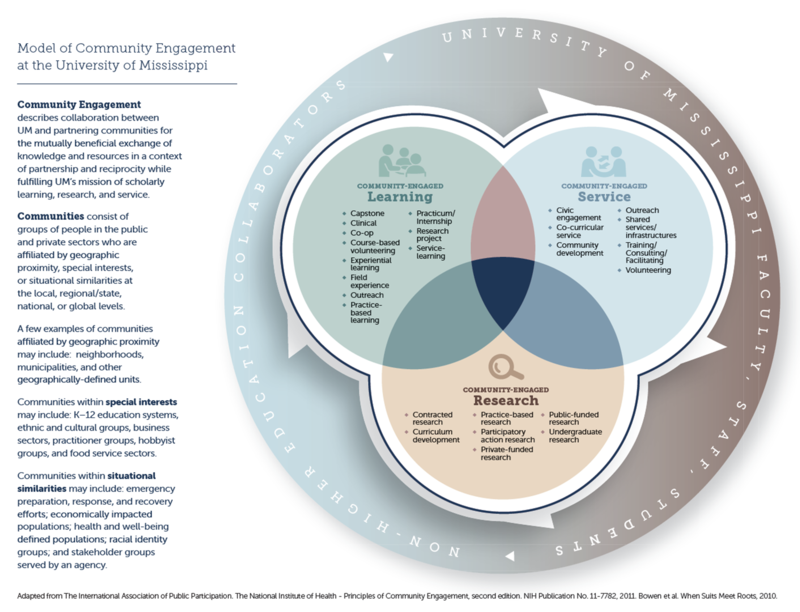 The third layer represents UM’s scholarly missions of research, teaching, and service which informs the engaged scholar’s activities from the institutional perspective. Research relates to the discovery and development of knowledge, while teaching corresponds to the dissemination of knowledge and changing learning. Outreach connects with changing behaviors and conditions. Within either the six entry points for engaged activity and the three missions of institutions, the specific type of activities inform one another in an additive manner. Therefore, taking a comprehensive approach of using teaching, research, and outreach to understand and address complex issues is a better approach than conducting engaged scholarship in only one or two mission areas. The outer circle illustrates three types of factors that affect the success of engaged scholarship, including: i) assumptions about engaged scholarship, ii) external factors, and iii) internal factors. Assumptions about engaged scholarship include how the institution and individuals define scholarship, recognize the essential elements of scholarship, value community collaboration as a scholarly method, and reward engagement in annual review and promotion and tenure. External factors relate primarily to community partnerships and the corresponding commitment, communication, trust, conflict resolution, political environment, and community context influencing those partnerships. Internal factors include how engaged scholarship is understood within the faculty promotion and tenure system, the departments’ and colleagues’ attitudes toward internal and external collaboration, institutional silos, institutional history, available funding, mentoring, administrative support, and institutional leadership.